Modified Toyota Fortuner from Executive Modcar Trends looks hot! While we have seen many modified Toyota Fortuner SUVs so far, the one from Executive Modcar Trends takes the cake with its enhanced looks. This modified Toyota Fortuner is based on the previous generation model, which looked quite bold even in its stock format. The custom model receives several styling enhancements, particularly at its front-end. The highlights of the revised styling package include a custom front grille, updated headlamps with projector units and DRLs, and a bolder front bumper. The hood receives a bold scoop, while the SUV receives several red highlights for a bolder appearance. In the side profile, the modified Toyota Fortuner features flared wheel arches that sport a black plastic cladding. The SUV rides on aftermarket machined alloy wheels that have been shod with wider tires. The C-pillar has received a black plastic cladding to help the greenhouse mimic the latest-gen model. Even the tail lamps have been updated to look a fair bit like those on the current version. Other than this, the posterior also receives a bolder bumper with red highlights and dual exhaust tips. 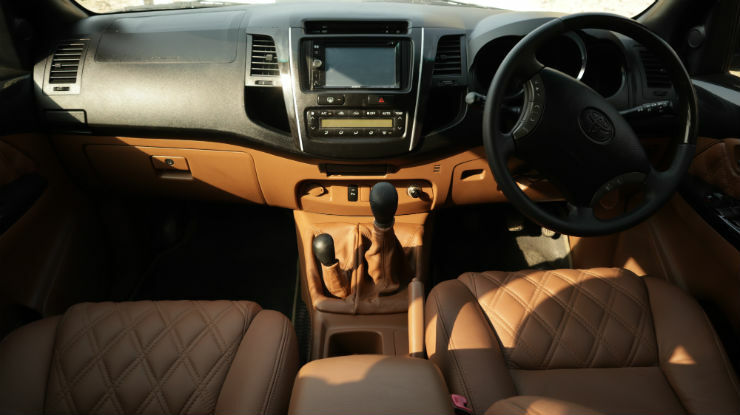 Even the interior of this modified Toyota Fortuner gets comprehensively updated. The seats receive a new leather upholstery that looks more premium than the stock material while the centre console has been updated with a 2-DIN touchscreen audio system. The interior of the modified Toyota Fortuner from EMT gets a premium leather seat upholstery and an aftermarket 2-DIN touchscreen audio system. The mechanical components have been left untouched, which means this modified Toyota Fortuner is powered by a 3.0-litre, four-cylinder oil-burner that produces a maximum power of 171 PS and a peak torque of 343 Nm. The cost of the modifications carried by this SUV is said to be around INR 4.5 lakh.